Theoretically ground wave attenuation is severe above 3 MHz making ground wave distance at 28 MHz limited to ten miles or so. Other forms of RF propagation still exist (diffracted space wave perhaps) as the KYPN confirms with observations of their 10m port providing service up to 50 miles distant. Here is the model prediction for the likely Robust Packet port in the 10m band. 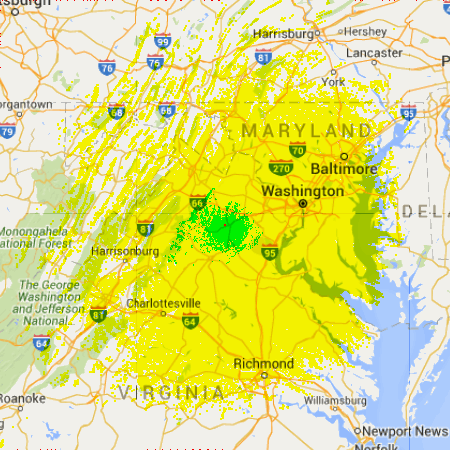 The strong signal area is smaller than for 6m, but the overall coverage grows slightly. Take the above as a general trend during low sunspots. The actual performance range is likely smaller. We envision only one 10m port on the VAPN.